1 Now He was telling them a parable to show that at all times they aought to pray and not to blose heart, 2 saying, "In a certain city there was a judge who did not fear God and did not arespect man. 3 "There was a widow in that city, and she kept coming to him, saying, 'Give me legal protection from my opponent.' 4 "For a while he was unwilling; but afterward he said to himself, 'Even though I do not fear God nor arespect man, 5 yet abecause this widow bothers me, I will give her legal protection, otherwise by continually coming she will bwear me out.'" 6 And athe Lord said, "Hear what the unrighteous judge said; 7 now, will not God abring about justice for His belect who cry to Him day and night, and will He cdelay long over them? 8 "I tell you that He will bring about justice for them quickly. However, when the Son of Man comes, awill He find faith on the earth?" 9 And He also told this parable to some people who atrusted in themselves that they were righteous, and bviewed others with contempt: 10 "Two men awent up into the temple to pray, one a Pharisee and the other a tax collector. 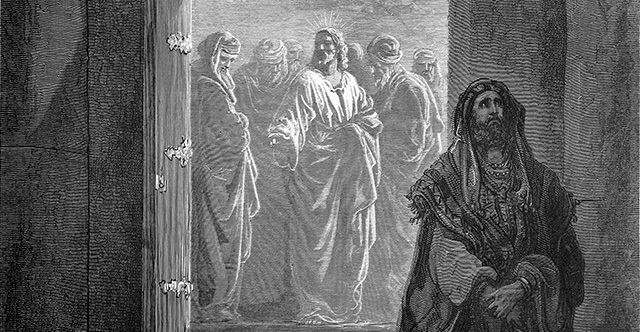 11 "The Pharisee astood and was praying this to himself: 'God, I thank You that I am not like other people: swindlers, unjust, adulterers, or even like this tax collector. 12 'I afast twice a week; I bpay tithes of all that I get.' 13 "But the tax collector, astanding some distance away, bwas even unwilling to lift up his eyes to heaven, but cwas beating his breast, saying, 'God, be merciful to me, the sinner!' 14 "I tell you, this man went to his house justified rather than the other; afor everyone who exalts himself will be humbled, but he who humbles himself will be exalted." 15 aAnd they were bringing even their babies to Him so that He would touch them, but when the disciples saw it, they began rebuking them. 16 But Jesus called for them, saying, "Permit the children to come to Me, and do not hinder them, for the kingdom of God belongs to such as these. 17 "Truly I say to you, awhoever does not receive the kingdom of God like a child will not enter it at all." 18 aA ruler questioned Him, saying, "Good Teacher, what shall I do to inherit eternal life?" 19 And Jesus said to him, "Why do you call Me good? No one is good except God alone. 20 "You know the commandments, 'aDO NOT COMMIT ADULTERY, DO NOT MURDER, DO NOT STEAL, DO NOT BEAR FALSE WITNESS, HONOR YOUR FATHER AND MOTHER.'" 21 And he said, "All these things I have kept from my youth." 22 When Jesus heard this, He said to him, "One thing you still lack; asell all that you possess and distribute it to the poor, and you shall have btreasure in heaven; and come, follow Me." 23 But when he had heard these things, he became very sad, for he was extremely rich. 24 And Jesus looked at him and said, "aHow hard it is for those who are wealthy to enter the kingdom of God! 25 "For ait is easier for a camel to go through the eye of a needle than for a rich man to enter the kingdom of God." 26 They who heard it said, "Then who can be saved?" 27 But He said, "aThe things that are impossible with people are possible with God." 28 Peter said, "Behold, awe have left our own homes and followed You." 29 And He said to them, "Truly I say to you, athere is no one who has left house or wife or brothers or parents or children, for the sake of the kingdom of God, 30 who will not receive many times as much at this time and in athe age to come, eternal life." 31 aThen He took the twelve aside and said to them, "Behold, bwe are going up to Jerusalem, and call things which are written through the prophets about the Son of Man will be accomplished. 32 "aFor He will be handed over to the Gentiles, and will be mocked and mistreated and spit upon, 33 and after they have scourged Him, they will kill Him; and the third day He will rise again." 34 But athe disciples understood none of these things, and the meaning of this statement was hidden from them, and they did not comprehend the things that were said. 35 aAs bJesus was approaching Jericho, a blind man was sitting by the road begging. 36 Now hearing a crowd going by, he began to inquire what this was. 37 They told him that Jesus of Nazareth was passing by. 38 And he called out, saying, "Jesus, aSon of David, have mercy on me!" 39 Those who led the way were sternly telling him to be quiet; but he kept crying out all the more, "aSon of David, have mercy on me!" 40 And Jesus stopped and commanded that he be brought to Him; and when he came near, He questioned him, 41 "What do you want Me to do for you?" And he said, "Lord, I want to regain my sight!" 42 And Jesus said to him, "Receive your sight; ayour faith has made you well." 43 Immediately he regained his sight and began following Him, aglorifying God; and when ball the people saw it, they gave praise to God.